Many of you know “Goose” from Discovery Channel’s gold show “Devil’s Canyon”, but most of the time he’s just like you and me. Working a regular job and going out on the weekends prospecting for gold. Here are his first thoughts from his first use of the flow pan. I get a lot of people asking to review their new equipment. And like a lot of prospectors and miners out there, I am very averse to change. There are so many new gimmicks and “trick” tools to use out there. Everyone has the “next best thing”, when in most cases, it doesn’t do anything better than the last piece of gear I had. 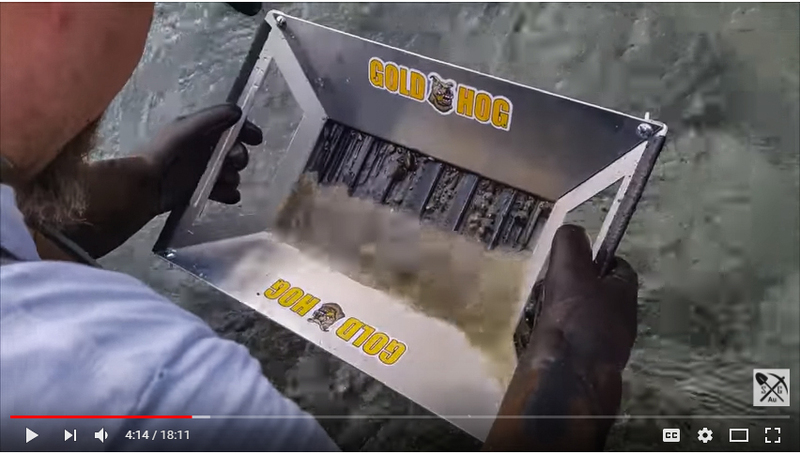 In December I figured I would try Gold Hog’s new “flow pan” and picked one up. After watching Doc’s video’s about how to use it, I had to wait almost a month before I could get it in the field. When it first arrived, I attempted to assemble it without reading the instructions…….wrong move. Once I read the instructions and got it put together, you can tell this is an incredibly sturdy piece of gear and because it’s made out of heavy gauge aluminum it’s not going to succumb to the weather and abuse it will see on a dig site. This thing is beefy. Once I was finally able to get it out into the field, I followed all Doc’s instructions on how to properly use it. I filled it up with 4 shovels of raw dirt out of the dig site, walked it to the river and went through the motions. It went through the raw dirt so fast it left me a little surprised. 4 shovels worked down in about 10-15 seconds. Transferred it to the gold pan and only after a couple taps, I could see what I was working with. What was most shocking, was the micron sized gold that it hung onto. Both I and my digging partner were shocked. Make no mistake, the Flow Pan is not a gimmick, it is not a toy for kids to play with. You can do some serious testing using this as your primary tool. You are doing it wrong, if you haven’t added this to your prospecting arsenal. And for the guys that can only use a shovel and pan out there……this is a MUST HAVE! I am happy enough with this product; I would put my own name on it.